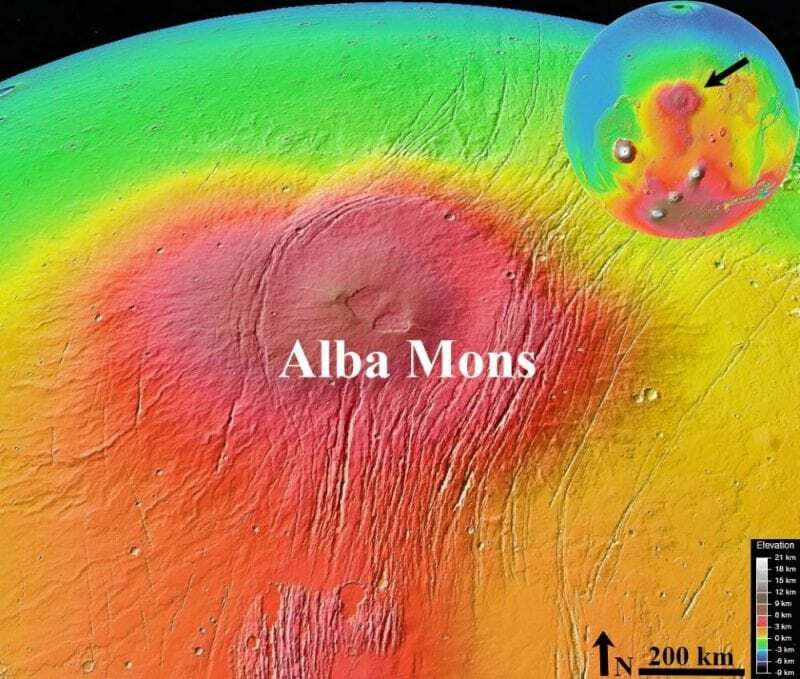 Alba Mons region in the northern middle latitude of Mars. Credit: MGS MOLA/NASA/Google Earth. Climatic conditions and accompanying glacial/periglacial processes have been suggested to vary on Mars during the Late Amazonian epoch (~1.0 Ga to present). While evidence for glacial landforms resembling past episodes of major and minor glaciation have been found on Mars, glacial landforms resulting from moderate glaciation have not been studied extensively. Thus, it resulted in a gap in our understanding of the moderate glacial episode that led to emplacement of glacial landforms intermediate in scale and extent to those resulting from major and minor episodes of glaciation. This study is focused on remote sensing based analysis of glacial landforms found in the interior of impact craters emplaced in the Alba Mons region (30˚-60˚N; 80˚-140˚W) of Mars and suggest that these glacial landforms have formed by moderate glaciation during the past ~10-100 Ma. Recent studies have shown that the middle latitudes (30˚-60˚) of northern and southern hemispheres of Mars host variety of glacial landforms resulting from accumulation and downslope flow of ice during the past ~1.0 Ga. Interior of impact craters are the places within the middle latitudes where the evidence for glacial landforms has been ubiquitous. This evidence includes large-scale (tens of kilometers) lobate debris aprons, lineated valley fills, and concentric crater fills. The best-fit age for these glacial landforms corresponding to ~100 Ma – 1.0 Ga has been derived using the crater size-frequency distribution method. In some places, it has been found that these glacial landforms tend to completely fill the host crater (regardless of its diameter), which collectively suggests that extensive accumulation and flow of ice has taken place in the past. On the other hand, there are some small-scale (within few kilometers) glacial landforms (e.g. viscous flow features) that have been found to just drape over the host crater wall or emplaced at the foot of wall slopes, thereby indicating minor accumulation and flow of ice. The best-fit age of these small-scale glacial landforms has been derived as within ~10 Ma. These previous studies gave us an opportunity to describe the type of glacial landforms possibly formed during the past ~10-100 Ma. To survey the interior of impact craters in the Alba Mons region, we used images acquired at a spatial resolution of ~6 m/pixel by Context Camera (CTX) onboard the NASA’s Mars Reconnaissance Orbiter (MRO). 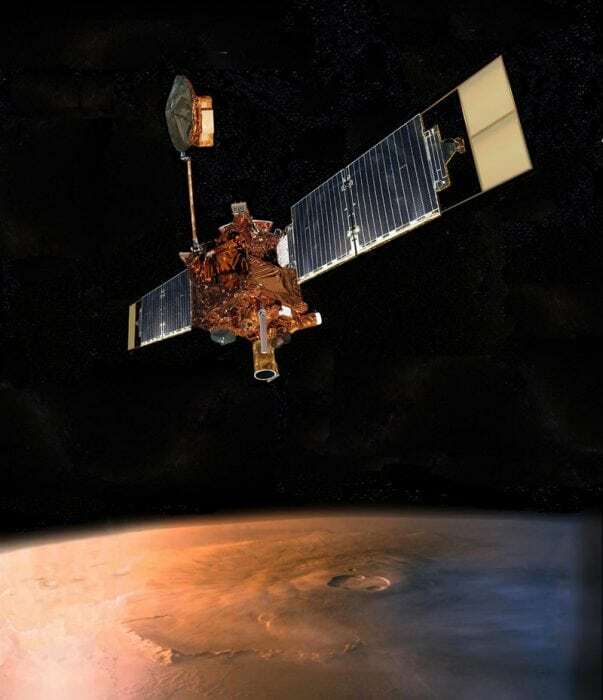 NASA’s MRO was launched to Mars on August 12, 2005, and since it began its science operations around Mars, it has sent back wonderful images of the surface. Our survey revealed the presence of lobe-shaped flow features preserved in the interior of 346 craters. The surface of these flow features shows evidence for morphologies resulting from sublimation of near-surface ice. This evidence includes brain-terrain texture and ring-mold craters. Together, this morphological evidence suggest that the flow features are ice-rich bodies. We found these morphological attributes of near-surface ice in the high-resolution (~0.25 m/pixel) images of flow features acquired by the High-Resolution Imaging Science Experiment (HiRISE) onboard NASA’s MRO spacecraft. Overall, the morphological study suggested that the flow features are similar to small-scale lobate debris aprons formed inside craters. Inside the host craters, these small-scale lobate debris aprons are found to be emplaced only on the pole-facing crater wall slopes as their evidence was not noted elsewhere inside the crater. They do not completely fill the host crater, as in the case of large-scale glacial landforms (e.g. concentric crater fills). This implies relatively reduced extent of ice accumulation and flows in formation of pole-facing small-scale lobate debris aprons than required in formation of concentric crater fills. However, in some cases, these small-scale lobate debris aprons extend up to nearly half of the host crater floor (maximum length of ~22 km) from the base of pole-facing crater wall, implying that the extent of ice accumulation and flow to be greater than that required in formation of viscous flow features. The crater-size frequency distribution method revealed that the best-fit age of these pole-facing small-scale lobate debris aprons is ~10-100 Ma. In this method, we plot the number of superimposed craters per square kilometer of the surface with respect to crater diameter. The underlying basis for this method is that the surface over which the craters are counted is assumed to be lack of any superimposed craters. As the craters started to form over the surface, the distribution of different diameter of emplaced craters can be used to derive the best-fit age of the surface. Thus, our study could make it evident that there was a glacial episode on Mars during the past ~10-100 Ma that facilitated relatively moderate extent of ice accumulation and flows in comparison to previously reported major and minor episodes of glaciation. Further, our study has brought to notice the evidence of pole-facing small-scale lobate debris aprons preserved inside the craters emplaced in the Alba Mons region of Mars. Lastly, we propose that these pole-facing landforms might be preserved in the interior of craters emplaced elsewhere in the middle latitudes and demand that detailed analysis of these landforms should be taken up in the future for a thorough understanding of glacial episodes occurred in the Late Amazonian. Sinha, R. K., & Vijayan, S. (2017). Geomorphic investigation of craters in Alba Mons, Mars: Implications for Late Amazonian glacial activity in the region. Planetary and Space Science 144, 32-48. DOI: https://doi.org/10.1016/j.pss.2017.05.014. This study, Geomorphic investigation of craters in Alba Mons, Mars: Implications for Late Amazonian glacial activity in the region, was recently published in the journal Planetary and Space Science. Rishitosh Kumar Sinha is an engineer at the physical REsearch Laboratory. His research focuses on morphological study of glacial/periglacial landforms: e.g. lobate debris apron/lineated valley fill, small scale lobate debris aprons, lobate floor fill, polygonal cracks, gullies, morphological insights from Mars and Earth-analogues in Ladakh Range, Himalaya, and morphological study of layered deposits: e.g. bright toned layered deposits.